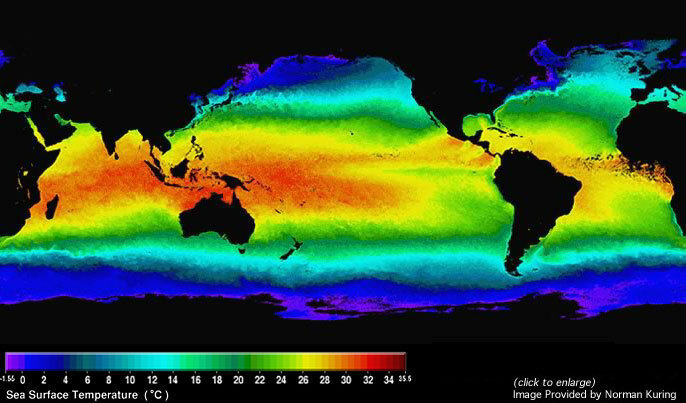 Scientists are monitoring changes in the Pacific Ocean that signal a developing El Niño. Will it be a large or small event? 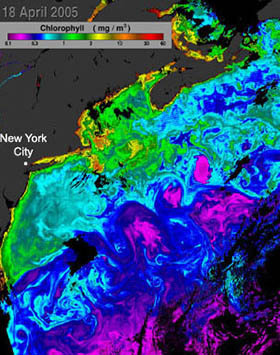 Learn to identify weather-related patterns in satellite data of the ocean. 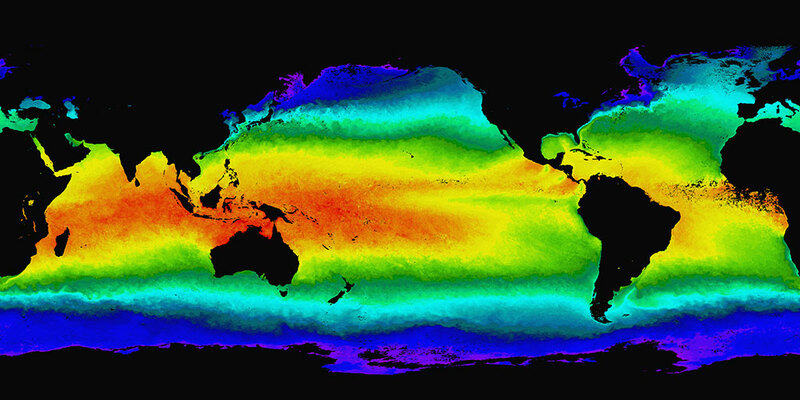 Read about the mechanisms that trigger El Niño. 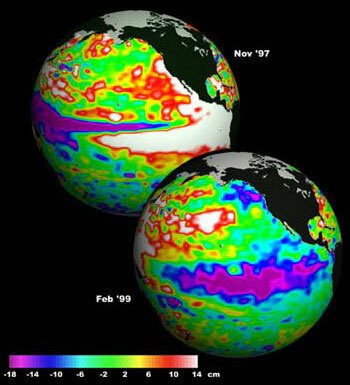 Note the growing El Niño in the movie. It is characterized by unusually warm ocean temperatures in the Equatorial Pacific. 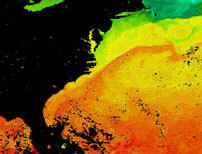 The data images show the West Coasts of Central and South America, in black, with the advancing warm waters in red, revealed through Sea Surface Temperature data (SST). The Loop Current and the Gulf Stream - The animation focuses on the Loop Current in the Gulf of Mexico as it flows into the Gulf Stream (a major surface current). Note the black colors indicate the warmest ocean surface temperatures and and light blues indicate the coolest temperatures. Sea surface temperature (SST) simulation from the Geophysical Fluid Dynamics Laboratory's (GFDL) high resolution coupled atmosphere-ocean model. Columbus departed Palos, Spain, with three ships on August 3, 1492. The Nina, a lateen-rigged caravel, the Pinta, a square-rigged caravel and the Santa Maria, a nao, was Columbus's flagship. He first landed in the Canary islands, and then the Bahamas on October 28. He sailed near Cuba and Hispaniola and returned to spain on March 15, 1493. 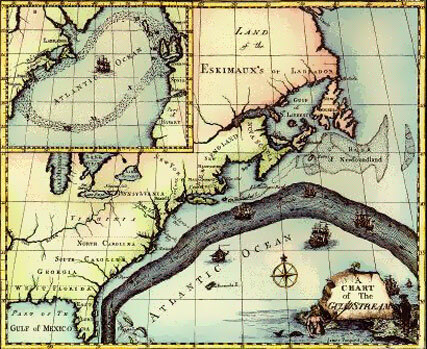 The location of the Gulf Stream plotted on the 1769 Franklin-Folger map depicted on the left, is remarkably similar to the location of the Gulf Stream as revealed by the satellite-derived sea-surface temperature (SST) patterns above. 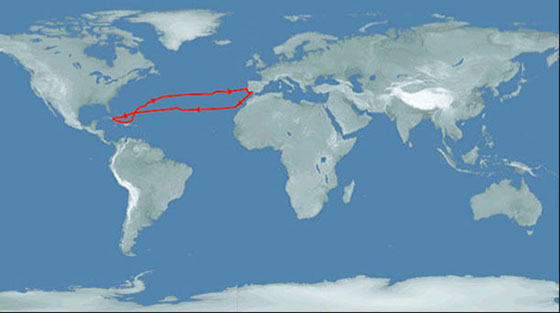 Franklin took measurements of the sea-surface temperatures during his crossings of the Atlantic, thereby developing a navigation technique based on the location of the warm Gulf Stream waters. Matthew Maury was appointed superintendent of the Depot of Charts & Instruments of the Navy Department in Washington, DC, in 1842. In this position, he made his greatest contributions to the Navy and the world, by studying navigational and meteorological charts. Maury conducted the first systematic study of the ocean's surface currents and winds from the thousands of logbooks of sailors' observations stored at the U.S. Navy's Depot of Charts & Instruments and published the first charts of the North Atlantic in 1847. In 1855, he published "The Physical Geography of the Sea," which is credited as one of the first books on oceanography. 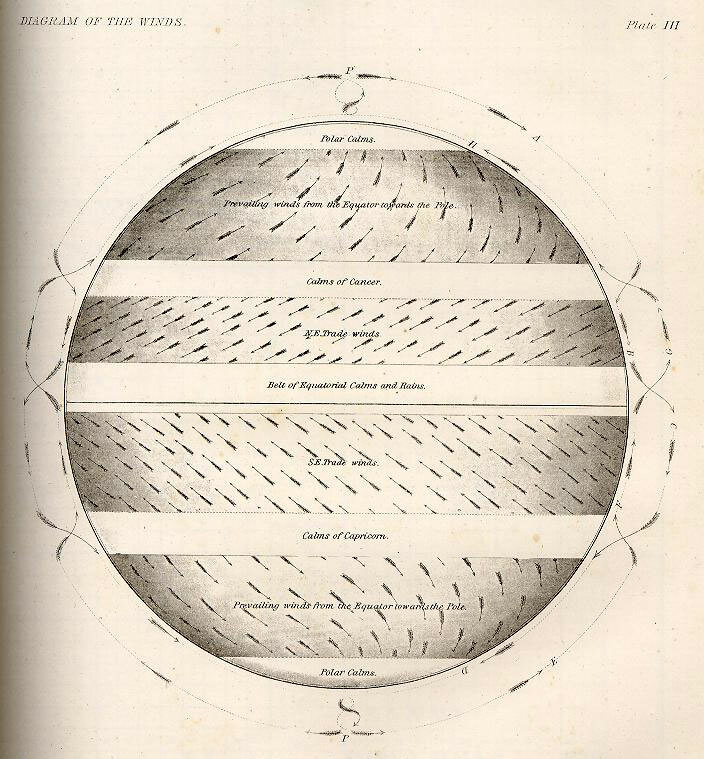 (1792 - 1843) is best remembered for the Coriolis force, motions on the surface of rotating spheres. 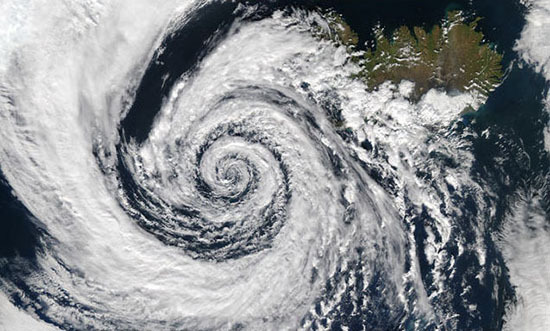 A beautifully-formed low-pressure system swirls off the southwestern coast of Iceland. Because this low-pressure system occurred in the Northern Hemispheres, the winds spun in toward the center of the low-pressure system in a counter-clockwise direction; a phenomenon known as the Coriolis force (in the Southern Hemisphere, the Coriolis force would be manifested in a clockwise direction of movement). Henry Melson Stommel (1920 - 1992) was driven to understand the forces that cause narrow, fast, Western Boundary currents to strengthen. Vilhelm Bjerknes, Walfrid Ekman, Harald Sverdrup, Henry Stommel, and Walter Munk developed the theories that form the basis of physical oceanography. Each made unique, and equally important contributions. The Ocean Basin Model, left, and Ship Drift Model above, simulate the Coriolis effect in the Atlantic Ocean. The model allows the user to control the rotation of the Earth and observe the effect on water in an ocean basin. 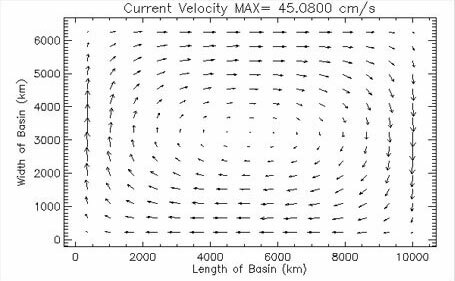 The arrows represent the current velocity at different locations within the basin. 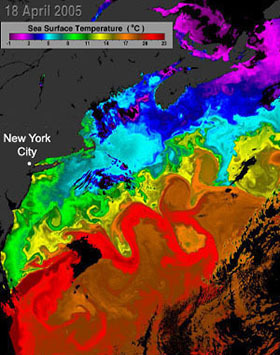 The warm heart of the Gulf Stream is readily apparent in the sea surface temperature depicted where swirls of warm waters can be seen off the eastern coast of the United States. As the current flows toward the northeast it begins to meander and pinch off eddies that transport warm water northward and cold water southward. The current also divides the local ocean into a low-biomass region to the south and a higher biomass region to the north. 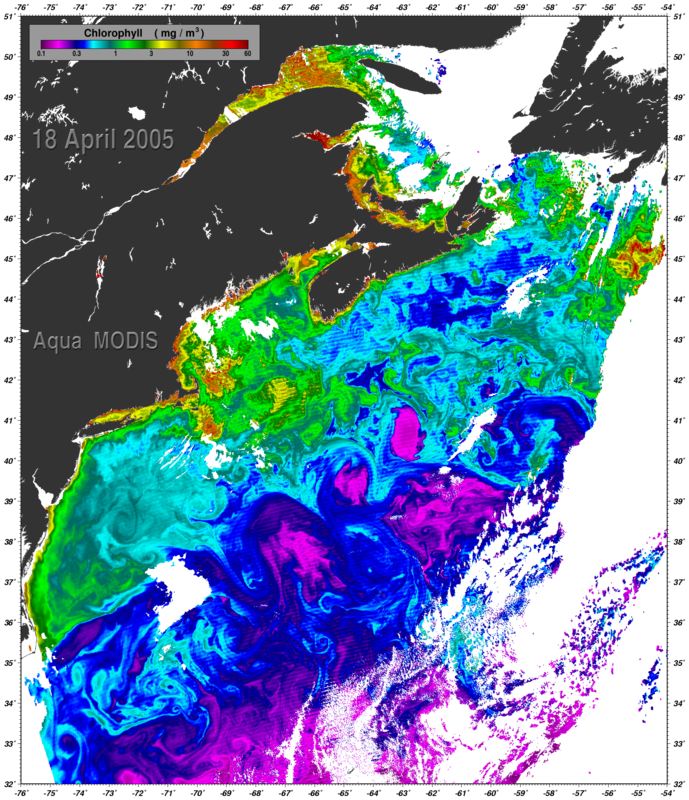 This is evident in the chlorophyll depiction where much higher quantities (in milligrams per cubic meter) can be seen at the more northern latitudes. 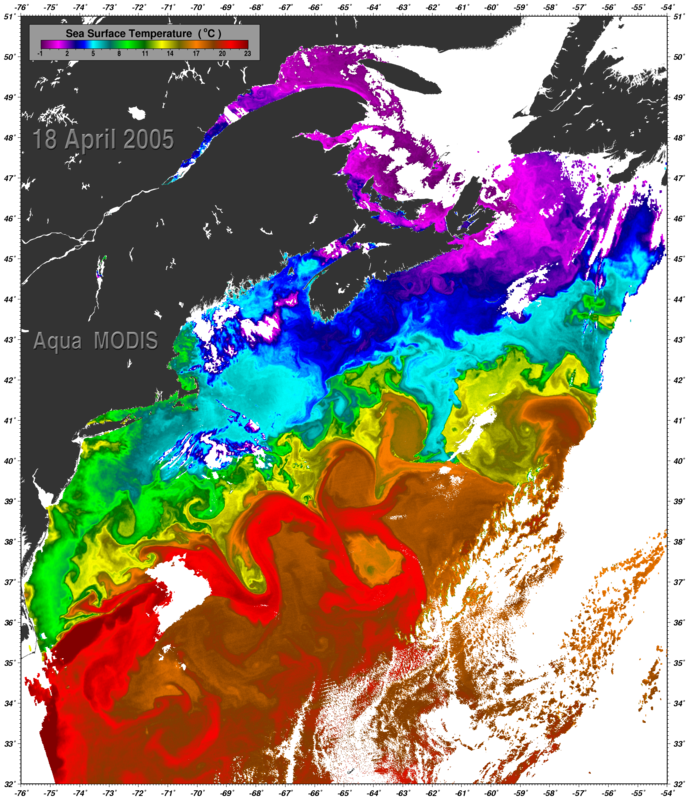 The data were collected by MODIS aboard Aqua on April 18, 2005. Walter Heinrich Munk is a major contributor to the field of physical oceanography and geophysics. At present, he is professor of geophysics emeritus at Scripps Institution of Oceanography in La Jolla, California. He has made fundamental, and pioneering contributions to our knowledge of ocean surface currents, deep circulation of the ocean, internal waves, surface waves, variations in Earth's rotation, ocean drilling, and tides. 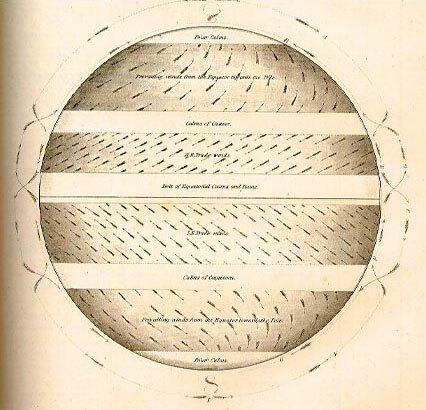 For example; he was the first to show how winds produce basin-scale currents (how winds drive the gyres) and he showed how ocean tides, tidal dissipation, and moon's rotation, and deep currents are related. The QuikSCAT mission is intended to record sea-surface wind speed and direction data under all weather and cloud conditions over Earth's oceans. 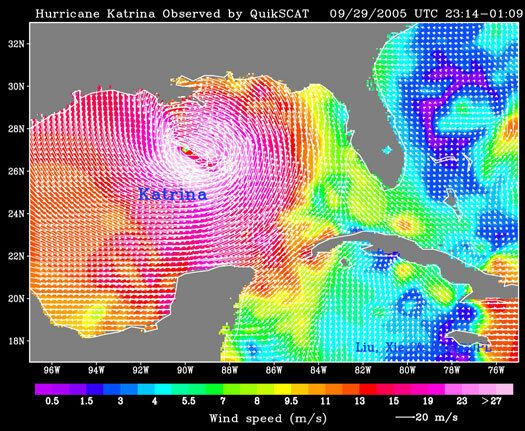 SeaWinds is the main instrument on the QuikSCAT satellite. The SeaWinds scatterometer is providing unprecedented, frequent surface wind speed and direction measurements over the global oceans. Coupled with other satellite measurements of cloud patterns, water vapor and rain, the data are contributing to scientists' ability to predict the intensity, location and movement of hurricanes and other severe marine weather patterns. Background - Timeline : 1990 - 1999 A.D. The TOPEX/Poseidon satellite mission's (1992-2006) most important achievement was to determine the patterns of the ocean circulation - how heat stored in the ocean moves from one place to another. Since the ocean holds most of the Earth's heat from the Sun, ocean circulation is a driving force of climate. TOPEX/Poseidon made it possible for the first time, to compare computer models of ocean circulation with actual global observations and use the data to improve climate predictions. Jason-1 is the follow-on to the TOPEX/Poseidon mission. Like TOPEX/Poseidon, Jason-1 will be able to measure the large and small hills and valleys of the ocean's surface. These measurements of ocean topography allow scientists to calculate the speed and direction of ocean currents and monitor global ocean circulation. The Figures show the 1997 El Nino (heights elevated off the Pacific coast of South America) and the 1999 La Nina (depression of heights in similar locations). 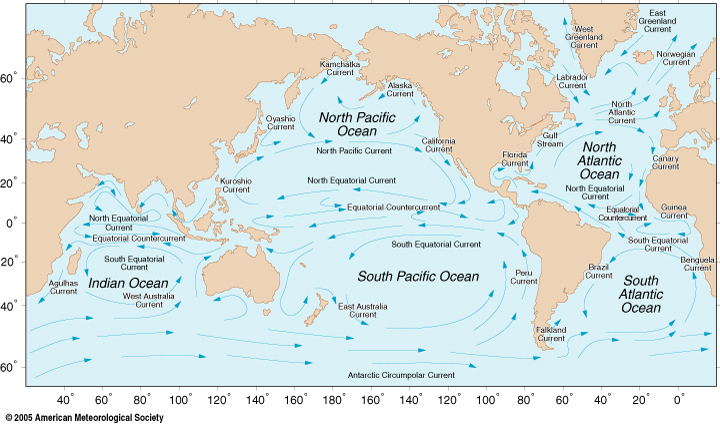 and direction of currents and about heat stored in the ocean, which help to predict global climate variations.